February 18 & 19, 1955. Quite a different type of ‘lines’ has had to be learned by some of the Young Wick Players for their next production Madame Tic-Tac which will be produced next Friday and Saturday at the Barn Theatre. The principal figure in the play is blind and deaf, and the special tic-tac language has been studied from leaflets supplied by the Institute for the Blind. Altogether the play is described as “pretty strong meat, and different from anything the Players have hitherto tackled”. For the first time they have a professional producer, Mrs. Joan Taylor, gold medallist, N.E.A. and final certificate Guildhall School of Music and Drama. She has had considerable experience in acting and producing and during the War was a member of a party entertaining the troops. She is also an author, having written two children’s books. When Betty Carpenter, who is Honorary Secretary of the Players, told me about the play, she emphasised that it was not thought suitable for children, and emphasise the fact, so I’m passing it on. TAKE a somewhat sinister cafe in the Edgware-road, fill it with a mixed bunch of pretty unsavoury characters, and there is the familiar setting for a thriller. 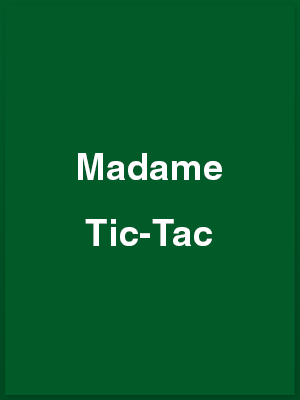 One important variation was made in Madam Tic-Tac, presented at the Bar Theatre by the Young Wick Players on Friday and Saturday evenings. The central figure in the maelstrom of mayhem was the blind and deaf owner of the cafe, who received her name Tic-Tac from the finger-tapping on her hand of those who spoke to her. What she did not possess in sight or hearing was counter-balanced by her voice, arrogantly masterful. This unusual character was played with great power by Eileen Turley. A battle of wills for the leadership of the gang brought out all that was worst in her chief of staff, Clem. cold calculating Clem, who did not stop at murder, and the framing of another for the crime to gain his ends. Ralph Dawes did well with his part. Beth, the cafe waitress, who was Madame Tic-Tac’s “eyes and ears”, brought Mary Gedge a chance to show what she could do with this type of character, and she took full advantage of the opportunity. Then there was bearded Hobby, so apparently unsophisticated anxious only to do his crossword puzzles, Desmond Tyler only just missed bringing him to life. Godfrey Evans was inclined to be a little of the mark as Rudge, the would-be wide boy, who thought he knew all the answers. Betty Carpenter added another to her gallery of successful characters as the bitter, over made-up, over-dressed Marguerite. Another fine portrait was given by Betty Gedge as Chloe, who has just completed three months “inside” and harboured grudge against the world. Luke , who wanted to come in with the gang, and was the pawn in the battle between Clem and Madame Tic-Tac, was personified by Ross Workman. Talkative Mrs Parsons, always alert to get something for nothing, was played with gusto by Barbara Mott and Peter Carpenter and Diane Topping did well as Detective Sergeant Harris and Kate. The play was produced by Joan Taylor. The term “tic-tac” is slang for sign language, “a method of interpreting words by means of hand signalling”. Although this was the only way of conveying information to the deaf and blind Madame Tic-Tac [in the play of the same name at the Barn Theatre, Southwick, last week] the Young Wick Players translated the words of authors Falkland Cary and Philip Weathers into a dramatic presentation of high standard. It concerns Madame Tic-Tac, wreaking personal vengeance upon society as the brains of a gang of criminals. Clem is second in command of a motley group which include bank clerk ‘Hobby’, taxi driver ‘Rudge’ and ‘lady of the street’ Marguerite. The bank robbery does not go according to plan: Madame’s son Luke is involved … Intelligently directed by Joan Taylor, each dramatic incident was brought out in high relief. Characterisation was, in most cases, clearly defined and sustained. Altogether the best production yet by this progressive group of young thespians. Eileen Turley played the title rôle most convincingly, giving the part authority, dignity and pathos. Betty Carpenter as the garish, wise-cracking Marguerite, was a little gem of characterisation. Ralph Dawes gave a competently controlled performance as the quietly sinister Clem, and Godfrey Evans was admirably cast as the cocky, talkative Rudge . Betty Gedge was excellent as the flamboyant Chloe, particularly in her earlier scene. Mary Gedge gave a sincere and receptive performance as the kindly Beth, Ross Workman was a callow, but still convincing Luke and Diana Topping’s Kate was sensitively acted. Peter Carpenter, lacking dominance, gave a creditable first performance as Det.-Sgt. Harris, and Barbara Mott. overplaying a ‘larger than life’ part, had good attack. Desmond Tyler, uneasily cast as Hobby, did not quite sustain the promising characterisation he had created.